Mexico: On Monday, February 12th, in the Miahuatlan federal road (Oaxaca), repeated shots from assault rifles hit the car where our brothers from the Indigenous people’s Rights Defense Committee (CODEDI) were driving, killing 3 comrades, two of them being underage. Who fired the guns, using weapons very similar to those of the ministerial police, did the dirty work for the governor Alejandro Murat and the businessmen who support him. The CODEDI delegation, headed by Abraham Ramirez Vazquez, was coming out of a meeting with state officials, when it was ambushed and was hit on the way back. Once again, bullets scratch the dark air in the endless criminal mexican night. Once again people’s blood irrigates the damp soil of this painful country. On Monday, February 12th, in the Miahuatlan federal road (Oaxaca), repeated shots from assault rifles hit the car where our brothers from the Indigenous people’s Rights Defense Committee (CODEDI) were driving, killing 3 comrades, two of them being underage. Who fired the guns, using weapons very similar to those of the ministerial police, did the dirty work for the governor Alejandro Murat and the businessmen who support him. The CODEDI delegation, headed by Abraham Ramirez Vazquez, was coming out of a meeting with state officials, when it was ambushed and was hit on the way back. The memory of these 3 deaths will keep on strengthen our struggle. Three victims who are part of the price that in Mexico is being paid to plan and build the autonomy of indigenous people, as the CODEDI is doing in its Training Center in the Finca Alemania, Sierra Sud Zapoteca. 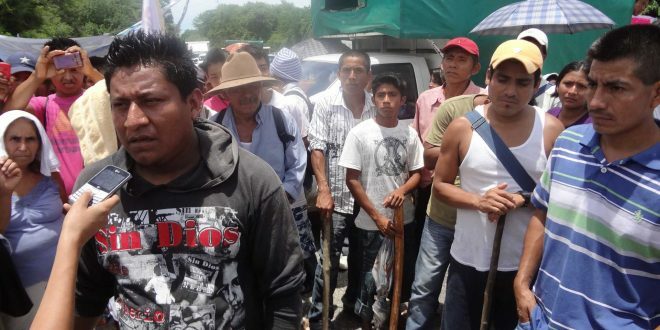 The same struggle towards autonomy carried on by the brothers and sisters of OIDHO, by the Autonomous Organizations of Oaxaca (COOA), by the National Indigenous Congress (CNI), by the EZLN and all the other peoples for whom autonomy is the only way to survive as indigenous people, avoiding being crushed by the devastation perpetrated from the government police or the murderous economy of narco-capitalism. This dream is already here, as an ongoing experiment in the middle of the war fought in Mexico (with more than 180.000 murdered in 12 years) and, since many years now, makes us accomplices, comrades and brothers of CODEDI and the Magonist Zapatists Alliance ( AMZ). Their demands are our requests, no matter from where we demand them; this struggle for life and against death is the same struggle we carry on in Europe, in the countryside as in the neighborhoods, in the streets as in the mountains. We will not just denounce this State crime, whose responsibility lies with the Murat’s state government and Peña Nieto’s federal government; we will keep on seeding rebellion and anger to reap organization and hope. Stronger than bullets, bigger than their big economic projects: like the sun, the wind, the rain, the joy, the sadness, and the soil, which now fondly receives our beloved brothers. Next to CODEDI, not a step back! Individual members in Germany, France and Italy.